3 Level Trolley Cart. 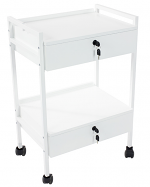 This is a versatile 3 level salon cart with 2 shelves, a sliding storage bin and an open basket. 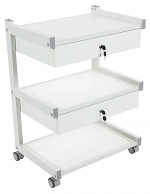 It features an attractive design, lightweight, metal frame, platic shelves and bin, and easy rolling wheels. Space between shelves is: 13"
Salon Cart with Drawers. 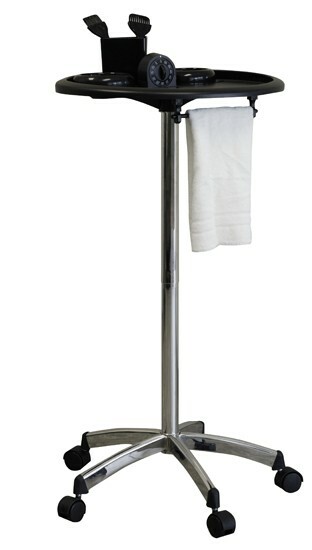 This beautiful "top of the line" salon cart is sturdily constructed with laminated wood and steel. Attractively designed it has two drawers, an open storage shelf and a top work shelf. Of course the four non-stick castors mean that it is a breeze to move around. Overall dimensions: H 33" 1/2 X L 25" X W 14"
Inside shelf measurements: L 22" X W 14"
Distance between the shelves: 12"
Dimensions:Tray: 17.5 x 12.5" Stand: 33.5 x 52"
Perfect for my small business. Nice new hot!! !